My name is Maya, although, to most people in Saint Louis, Senegal, I was “mah” “toubab” or pretty much anything other than my actual name. At the time of my project, I was 17 years old and heading into my final year of high school. I am from the small, quiet town of Eugene, Oregon, so adjusting to the unfamiliar noises of morning prayer calls and the screaming goats of Saint Louis took a bit of time. Upon arriving in Saint Louis, I had no idea what to expect. I intentionally did minimal research on the city and the way it looked, as I wanted to have no expectations coming into the experience. As intimidating and foolish that may seem I wanted to immerse myself in the culture with no expectations of how my trip would be. As expected, when I stepped off the plane, I was immediately met with a wealth of new sights, smells, sounds and people. Although it became easier to adjust as time went on, this notion of chaotic unfamiliarity never left me the entire time I was in the country. I was lucky to have stayed with my host family, together with a fantastic group of volunteers. On the first day, we bonded over the initial awkwardness of living in a stranger's home and became great friends from there. Our host mother had two young daughters who enjoyed playing with us, bringing us flowers and showing us their toys. These young girls, although they spoke only in Wolof, helped me connect with the other volunteers in the house, as we had to work together to communicate with them. There were two American volunteers, one girl from Spain, and one from France. Between the four of us, we were able to communicate with each other by switching between French and English, and in the end, we all improved our language skills. Since our time in Senegal, we have all kept in contact and even travelled together again! The project I chose was the Care & Community High School Special. This was perfect for high school students, as it was just enough time to feel immersed and adjusted to the culture, but it was not long enough to make us feel homesick. Our days were broken up by our activities, with time for lunch and exploring in between. The group of students were full of bright, motivated people who all shared the same passions for travel, exploration and helping others. 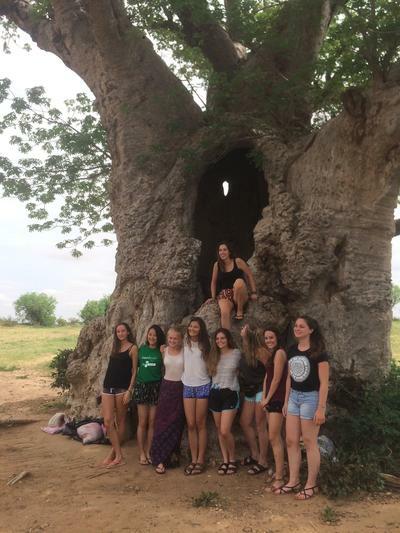 Because we came from all over the world, it provided me with a cultural experience beyond just being in Senegal, as I interacted and lived with people from Spain, France, Luxembourg, Japan and England. At 7 am, my alarm would go off, and our host family would serve us a breakfast of bread, butter and tea before the bus came to fetch and take us to the children’s centre. 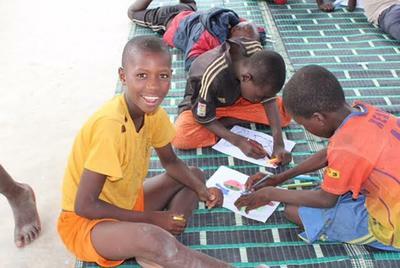 This centre, operated by the wonderful local Projects Abroad staff was open to the Talibés, the local children who fill the streets of Saint Louis. 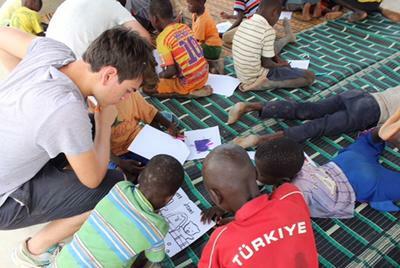 At this centre, these children were able to come in for snacks, games, art projects and language lessons. Most of the work I did involved teaching English to the older children and French to the younger ones who only spoke Wolof. Although I am fluent in both French and English, this was a real struggle, as I was unable to translate our lessons back to Wolof. It may have been difficult, but there was no better feeling than seeing one of their faces light up when they finally grasped a concept or managed to pronounce a word they had been struggling with. The staff at the centre was some of the most dedicated, heartwarming people I have ever met, and it was evident that the children loved and admired them with great respect. The second half of the day was spent sweating in the hot afternoon sun at a construction site. The first day we arrived, there was nothing but a pile of bricks, sand and tools. None of us had any construction experience, but with the help of local construction workers and the Projects Abroad staff, we were able to construct and paint an entire classroom in the span of two weeks. This classroom was intended for the girls in the community, who up until then did not have the same access to a classroom as their male peers. The most rewarding part of this experience was on the last day when a group of mothers came to the construction site to thank us for building the space for their daughters. Their gratitude and appreciation made all the volunteers feel as though our work meant something, and really validated the work we had done within the community. 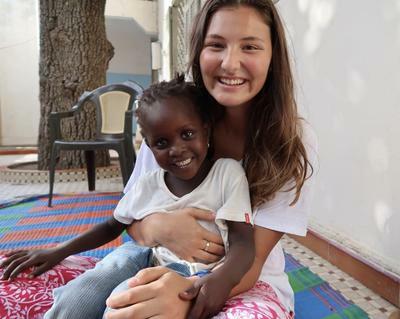 My time in Senegal, although brief, taught me lessons that I have carried forward with me to college, and will continue to carry forward throughout my life. The memories and friendships I made extend far beyond the borders of the country, and the two-week time span I had. Watching the sunset on the sand dunes of the Lompoul desert, swimming in the warmth of the ocean, and spending time with the children are memories I could have never made had I not come to Senegal. Things were not always easy, but they were always worth it. For anyone looking to explore another culture, meet new people, and volunteer in a meaningful way, I would highly recommend doing your research, planning a trip and setting out with Projects Abroad.